Sorry... the 2017 Toyota Prius is no longer being sold as new. Instead, take the first step to a great deal on 2019 Toyota Prius with a free price quote! 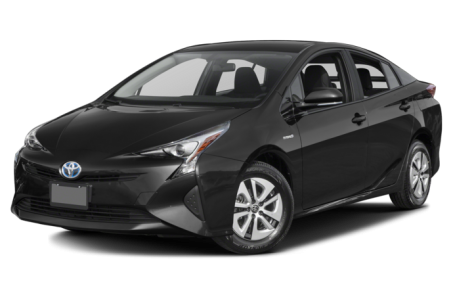 The 2017 Toyota Prius is a fuel-efficient hybrid sedan. It competes with the Kia Optima Hybrid, Hyundai Sonata Hybrid, and Ford Fusion Hybrid. This year, the regular Prius remains largely unchanged. However, a new plug-in version called the Prius Prime comes with a different front fascia and rear-end. Six trims are available: the Two, Two Eco, Three, Three Touring, Four, and Four Touring. Since its redesign in 2015, the Prius still has one of the most bizarre looking designs on the market. The front-end is a collection of intersecting lines that layer and converge toward the center Toyota emblem. The most peculiar feature of the Prius is the pair of warped, anvil-shaped LED headlights. At the rear, the Prius has vertical, fang-shaped LED taillights. The Prius also utilizes active grille shutters that open and close at certain speeds for better aerodynamics and fuel efficiency. The Prius Prime is differentiated by sleeker styling at the front and rear. It has narrow-slit LED headlights and signature, vertical LED lights at front and rear fascias. A unique bow-shaped taillight ensemble stretches across the rear-end. Under the hood, the Prius still uses a 1.8-liter four-cylinder gas engine which combines with an electric motor. Fuel efficiency for the Prius is an EPA-estimated 54/50 mpg city/highway. The Prius Prime has a larger 8.8-kW-hr lithium ion battery for 640 miles of total driving range. Inside, the Prius has a standard fabric interior with a 60/40 split-folding rear seat. The center stack features an updated Entune multimedia system that includes a 11.6-inch touchscreen, Bluetooth connectivity for phone and audio, Siri Eyes Free mode, and a USB port. It can be upgraded with an integrated navigation system, a satellite radio, and a JBL premium audio system. Standard features include air conditioning, cruise control, remote keyless entry, and push-button start. Available features include a power moonroof, power/heated front seats, and a heads-up display. All Prius models come with Toyota Safety Sense P, which is a package of active safety features. It includes adaptive cruise control, automatic high beams, pre-collision warning with pedestrian detection, brake assist, and lane departure warning. Other standard features include a backup camera and a tire pressure monitoring system. Available Safety Connect services include emergency assistance, stolen vehicle locator, roadside assistance, and automatic collision notification. 64 of 65 (98%) consumers said they would recommend this vehicle to a friend.